Litwalton, Texas, Garza County ghost town, 1907 vintage postal map. Litwalton is found imprinted on a 1907 postal map. We will publish additional information when it becomes available. "We had not lived here (Garza County) very long until we discovered we had an old man, Ed Bolden, for a neighbor, and soon J.I. Wilbourn moved his family from Gail near us, about two miles, then we discovered a Newt Graham lived in Cooper's Canyon, and a Mr. Justice, about one mile southwest of him. Mr. Wilbourn, Mr. Justice, and my father decided we needed a post office near, so we made application and received permission to have a post office. Mr. Justice made the application for the job as postmaster, and he got the job, also permission to name it, and he gave it the name of Litwalton. I believe from where he came in Denton County there was a postoffice (sic) by that name and he liked it, Litwalton it was. My father got the job of carrying the mail from Litwalton to Lynn, a place about eight miles north of where Tahoka is now..."
While I was growing up in Post, Cooper's Canyon was a popular picnic area with a dependable spring year round. I remember the remains of a dugout above the spring-fed creek on the north side of the canyon and faint traces of a road that ran past the dugout and up the Caprock westward toward Lynn County. My Grandmother, Willie Etta Marable, spoke of a post office being in that general area when she and her family were living and working on the U lazy S Slaughter Ranch in that area of Garza County at the same time period as that described in the above narrative. 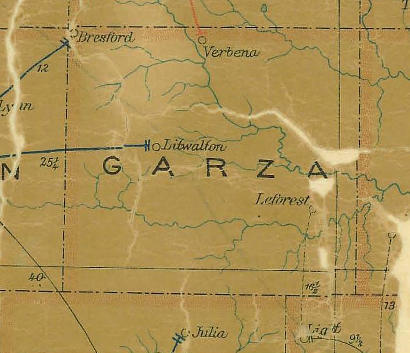 If you have access to a copy of Wagon Wheels, A History of Garza County, a narrative about my Grandparents F.E. (Bud) and Willie Marable's family begins on page 45. Texas Handbook Online does not give any information on Litwalton. I looked at the Texas Genweb site for Garza County, and don't recall seeing anything on the town. However, according to Jim Wheat's Post Masters and Post Offices of Texas, Litwalton had a post office on May 2, 1903, with Charles W. Justis the first postmaster. Later Mary V. Gates took over (Oct. 18, 1906) and then the post office was discontinued July 31, 1907, when the mail went to Tahoka in Lynn County. Apparently Litwalton did not survive. Anyone wishing to share history/story or photos of Litwalton, please submit history as email message, and send photos as email attachments to history@texasescapes.com. Thank You.